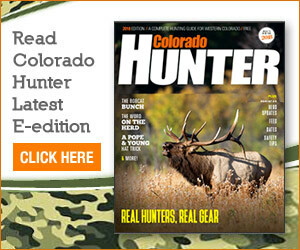 Colorado Parks and Wildlife hunting and fishing licenses for the 2013-14 season are on sale at retail outlets, Parks and Wildlife offices and online. The deadline to apply for a big game hunting tag is April 2. Anglers carrying a 2012-13 license are reminded that they must purchase a new license beginning April 1. A resident annual fishing license costs $26. Youths ages 15 and younger do not need to purchase an annual license but are required to buy a second rod stamp for $5 if they plan to fish with a second line. Seniors ages 64 and older may purchase an annual fishing license for $1. Additionally, Parks and Wildlife is asking resident anglers to be on the lookout for “bucket biologists,” especially at state reservoirs. Transferring fish from one water source to another is illegal in Colorado. Anglers who think they have witnessed suspicious behavior can call Operation Game Thief at 877-265-6648. Boaters also are reminded about mandatory inspection and decontamination programs in place at 27 state parks and 58 other locations throughout the state. Resident small game licenses also are on sale for $21, or $1.75 for hunters ages 18 and younger. Full price resident small game licenses can be combined with an annual fishing license for $41, yielding a savings of $6. License purchasers between ages 18 and 64 are required to buy a $10 habitat stamp. Proceeds from habitat stamps benefit wildlife habitat preservation programs throughout the state. The purchase of any fishing and hunting license also includes a search and rescue fee. Mountain Lion hunters holding a 2012-13 license can continue to hunt through April. Beginning April 1, lion hunters will be required to purchase a new 2013-14 license, which will be valid through March 31, 2014. Turkey season begins April 13. Resident licenses cost $21, or $11 for hunters younger than 18. Parks and Wildlife also offers an annual Colorado State Parks pass for $70, which provides access to all 42 Parks and Wildlife-managed parks for one year from the date of purchase. For more information about fishing, hunting, state parks or to purchase a license, visit www.cpw.state.co.us. Joe Moylan can be reached at 970-875-1794 or jmoylan@craigdailypress.com.Joe Moylan can be reached at 970-875-1794 or jmoylan@craigdailypress.com.Joe Moylan can be reached at 970-875-1794 or jmoylan@craigdailypress.com.